A power supply module with a cylindrical connector, a fuse, an indicator LED and a slide switch. The module has a output signal informing about the state of connection of the cylindrical connector. It is currently the most recent version of a power module for an external power adapter. A switch-selectable power supply input. An option to fit the module with a WAGO cage clamp terminal block or a FASTON connector. An indicator of a turned-on state. A circuit configurable for 12V or 5V. The ground unconnected to the motherboard. 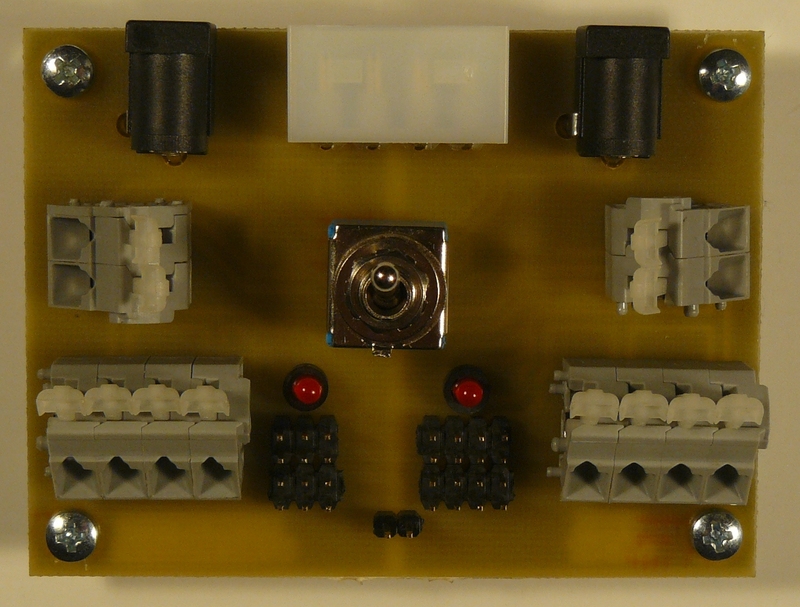 A universal input power supply module with HDD connector for 5V and 12V, cylindrical input connectors, PPTCs, emissions suppression and a power switch. The module also contains an indicator diode to signal a connected power supply. An input voltage is distributed to other modules through pin-header connectors of a standard configuration. Powerful WAGO256 terminal blocks for a distribution of larger currents are included. However, it is possible to replace the cage clamp terminal block with cheaper FASTON connectors.